Wow wow wow Newquay Sea Safaris and Fishing has been enjoying spectacular sightings of the rare Risso’s Dolphins in Newquay Bay for nearly a week. Cetaceans often feed in the bay and are vulnerable to disturbance as we have a great deal of watersports and watercraft activity during peak season. We hope that all will respect the animals that come to feed here so that generations to come enjoy them as we have done today . So that the population health and behaviour can be observed . The Marine Conservation Society Ocean Ambassador Deborah Meadon and Peter Richardson Head of Ocean Recovery also experienced the Risso's as they cruised offshore through Newquay's Marine Conservation Zone (MCZ) . Peter heads the MCS MCZ campaign and urged us to support the Preposed 41 new MCZs , 8 of which are suggested to be sites around Cornwall. Please support their campaign and sign up to help set up protection for the feeding grounds for these spectacular animals. In Newquay and The Gannel it is the seabed that is protected and potting, netting and line fishing continue to do well as healthy seabed mean healthy habitats for marine life to thrive and therefore benefits the marine mammals as well as the fishers. It’s helpful to record any disturbance to the Cornwall Marine and Coastal Code Group who look for areas to improve education about our Cornish Marine Wildlife and ultimately aim to protect it . The “feel good factor” continues for our passengers throughout our unusually warm summer as we see Sunfish , Dolphins , Seals and seabirds on becalmed seas and blue skies . 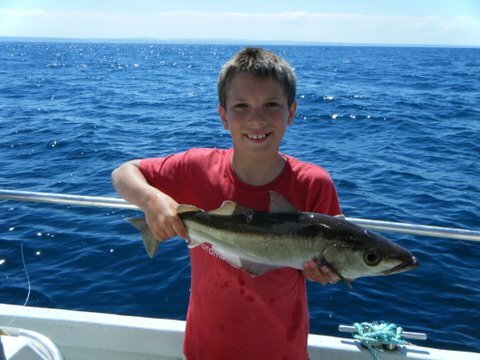 Newquay Fishing Trips and Sea Safaris. Close Encounters of the Sharky Kind!! Happiness is.....Bottlenose Dolphin Calf !! Shark Cage Diving UK at Its Best! !